With a high-definition touchscreen, a whopping 16GB of RAM, 1TB of storage and an i5 processor, this Dell laptop is a portable powerhouse. If you need something reliable for work that'll handle a solid amount of ,multitasking, this is ideal. Save $60 off the MSRP. If you're after a cheap replacement laptop or just something for basic work tasks like document editing, web browsing and email then this very portable laptop should keep you going for an incredibly low price. It's even better value when you consider it's a convertible touchscreen too. 32GB of storage isn't great though and you'll struggle to download too many future Windows updates with that much capacity. This dinky little laptop is much more portable than your regular full-sized laptops and super cheap too. A word of warning though, with just 32GB of storage it'll struggle to keep up-to-date with multiple Windows updates in the future as there probably won't be room for them eventually. But if you just need something cheap for on the move or as a backup laptop, this is a decent option. This 14-inch Chromebook costs more than the cheap Windows laptops mentioned earlier and only has 32GB of storage too. But seeing as it runs on the super light and fast Chrome OS, that's nowhere near as much of an issue as it is with a low-capacity laptop running the bloated Windows operating system. Add in a HD display, dual-core Intel Celeron processor and 4GB of RAM and you have a very capable Chromebook that will power through multiple basic tasks at once with ease. If you're after some extra power in your Chromebook experience, then this version comes with a Quad Core Celeron processor. This is great for a bit of extra multitasking. Look out for the small 16GB of storage though as you'll probably need a USB drive if you're wanting to store lots of big files. Save $180. The Ideapad range from Lenovo is a solid choice for any laptop user and this model has been built with a speed and multitasking in mind thanks to the 8GB of RAM and 256GB SSD. 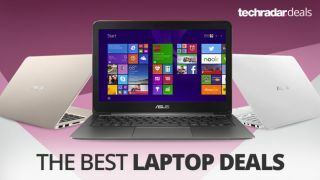 This laptop deal will expire soon though, so act fast if you want to save. Another ultra-portable laptop, this Acer machine weighs less than 2.5 pounds, while still packing a powerful i7 processor, 8GB RAM, and a 512GB SSD. Better yet, it's dropped by $500 for in Adorama's laptop sale today.